This theme will have children running as fast as the gingerbread man and decorations out of homemade scented dough as they prepare for Christmas. Decorations, crafts, and activities perfect for a yummy Christmas time. 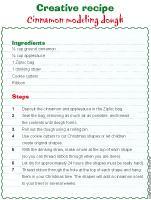 (Open thematic poster-Christmas-Gingerbread) Print, laminate, and decorate the walls of your daycare with all kinds of posters. 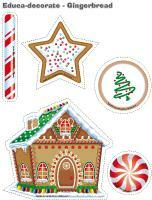 (Open educa-decorate - Gingerbread) Print, cut out, and laminate. Use the illustrations to decorate the walls of your daycare and to set the mood for the theme. Use them to create a fun mobile which can be hung above your changing table or in your cloakroom. The following special tool was created in response to a special request received. (Open name tags-Gingerbread) Print and use the name tags to identify children's belongings, cubbyholes, etc. Prepare a gingerbread recipe. Deposit the cookies in a special box, much like a little treasure chest. During circle time, gently open the box with your group. Ask them if they know what this type of cookie is called. Give each child a cookie so they can taste the gingerbread. Ask children if they like the taste of gingerbread or not. 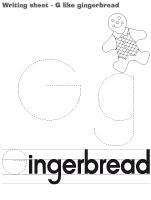 (Open picture game-Gingerbread) The pictures may be used as a memory game or to spark a conversation with your group. Use them to decorate your daycare or a specific thematic corner. Print, laminate, and store the pictures in Ziploc bag or in your thematic bin. 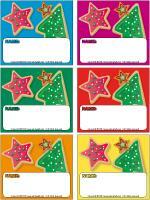 (Open writing sheets-G like gingerbread) Print for each child or laminate for use with a dry-erase marker. (Open stationery-Gingerbread) Print. Use the stationery to communicate with parents, in your writing corner, or to identify your thematic bins. 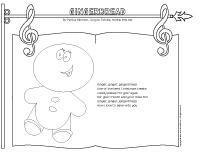 (Open activity sheets-Gingerbread) Activity sheets are provided for each theme. Print and follow instructions. 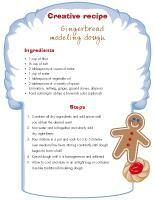 (Open educa-nuudles-Gingerbread) Print for each child. Have children color the sheet and use Magic Nuudles to give it a three-dimensional look. Variation: You don't have Magic Nuudles? Have children fill the spaces designed for Magic Nuudles with bingo markers or stickers. Use the cards to spark a conversation with your group or in your reading and writing area. They may also be used to identify your thematic bins. (Open word flashcards-Gingerbread) Print. Cookie, gingerbread man, eyes, nose, mouth, candy, icing, cookie cutter, ginger, cookie sheet, brown, oven. Make a special gingerbread-shaped necklace and let a different child wear it each day. Grant your daily gingerbread man privileges such as being first in line, the first to get his/her plate, etc. (Open sequential story-Gingerbread) Print and laminate the illustrations. Encourage children to place them in the correct order to recreate the story. (Open picture clue story-Gingerbread) Print. Sit in a circle with your group. Begin reading the story. Each time you reach an illustration, point to it and encourage children to say the missing word. (Open characters-Gingerbread) Print and laminate the animals. If you wish, glue a Popsicle stick behind each one to make it easier to present them to little ones. Use the animals when you read the Gingerbread man fairy tale to little ones. Mmm ... Something smells good! Present a variety of spices and encourage little ones to smell them. Cinnamon, ginger, nutmeg, and cloves are interesting choices. (Open characters-Gingerbread) Print and laminate the characters. Set up an obstacle course and arrange the characters along the way, in the same order as they appear in the gingerbread man story. As children complete the obstacle course, they must stop each time they reach a character and say, "Run, run, as fast as you can. You can't catch me, I'm the gingerbread man!" Throughout the theme, organize different types of races. Have children move in a variety of ways or divide your group into teams. Encourage children to suggest original types of races. Just like in the popular game of "Simon says", give children different instructions. They must execute them only if you said "The gingerbread man says..." first. Hide 20 gingerbread man illustrations throughout the yard. When you give the signal, children must work together to find all of them to receive the "treasure" (a box filled with gingerbread cookies, modeling dough with gingerbread man cookie cutters and special candy pieces). If there is a bakery in your neighborhood, organize a visit with your group. They will love to see how bread and different pastries are made. Let a few children walk on the snow in your yard. After a few minutes, the other children must try to match their footprints to the correct gingerbread man (friend). Give each family a bag containing brown construction paper, arts & crafts materials, and a gingerbread man model. Each family must create their own gingerbread man. Display them on the walls of your daycare. Visit your local library (or bookstore) to find the gingerbread man storybook. Put the book in s small backpack along with gingerbread man coloring pages. Children can take turns taking the backpack home so their parents can read the story to them. 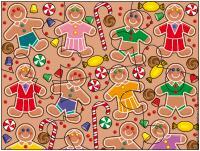 (Open educ-math-Gingerbread) Print and laminate for durable, eco-friendly use. Children must count the objects in each rectangle and circle the correct number. 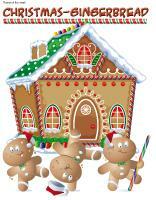 (Open educ-same and different-Gingerbread) Print and laminate for durable, eco-friendly use. Children must circle the illustration which is different in each row. (Open educ-pattern-Gingerbread) Print and laminate. Children must complete the patterns by sticking the cards in the correct squares using Velcro or adhesive putty. 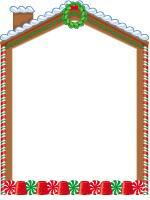 (Open educ-association-Gingerbread) Print the pages and assemble them in a file folder. Children must associate the illustrations. Once they have found the correct associations, they must stick the cards in the correct squares using Velcro or adhesive putty. (Open lacing-Gingerbread) Print, trace on cardboard, and cut out the shapes. Punch holes around the contour of each one and provide shoelaces children can lace through the holes. 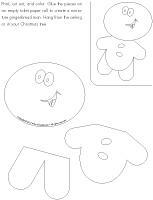 (Open giant gingerbread man) Print, laminate, and cut out each piece. Children assemble the pieces on the floor to complete a giant gingerbread man. (Open characters-Gingerbread) Print, laminate, and glue each character on a Popsicle stick. After reading the gingerbread man story to your group, encourage children to reproduce the story with the puppets. Set up a baking area which includes many tools used to make gingerbread men cookies. Among other things, offer rolling pins, cookie sheets, cookie cutters, plastic knives, and modeling dough. (Open puzzles-Gingerbread) Print and laminate (or use a puzzle you have on hand). Hide puzzle pieces throughout the daycare. Invite children to search for them and deposit the pieces in the centre of a circle. Once they have all the pieces, encourage them to assemble the pieces to recreate the scene. Combine all dry ingredients and add spices until you obtain the desired scent. Mix water and oil together and slowly add dry ingredients. Pour mixture in a pot and cook for 3 to 5 minutes over medium/low heat, stirring constantly until dough begins to form a ball. Knead dough until it is homogeneous and softened. Allow to cool and store in an airtight bag or container. Use like traditional modeling dough. Bake different sizes of gingerbread men with your group. In a bowl, beat the butter with the sugar until texture is smooth. Incorporate the egg and the molasses. Mix all dry ingredients together and add them to the creamy mixture. Stir well. Roll out the dough on a floured surface until it is approximately ¼ inch thick. Use cookie cutters to cut cookie shapes out of the dough. Deposit them on a lightly greased baking sheet. Bake on top rack of oven (preheated to 350 °F) for 12 to 15 minutes or until cookies are firm and golden. Let cool on wire rack. Let children decorate the cookies. Variation: For a simpler version, purchase a package of Pillsbury dough. (Open gingerbread house) Print for each child. Have them add crumpled pieces of newspaper to a brown paper lunch bag until it is half full. Fold the top down and staple along the fold to create a roof. Encourage children to color and cut out the windows and door and glue them on the house when they are done. Finally, they can decorate their gingerbread house by gluing the candy pieces on it. Trace gingerbread men models on sandpaper (which looks a lot like a cookie texture). Encourage children to cut them out (or do this step for them). Let them draw details on the gingerbread men using chalk. Hang them from the ceiling. (Open models-Gingerbread) Print two copies for each child. Staple the models together (back to back), leaving a small opening at the top. Let children fill their gingerbread man with cotton balls. Staple the opening when they are done. Let children decorate their gingerbread man as they wish. Prepare cinnamon-scented modeling dough (recipe below) with your group. Using cookie cutters, cut different sizes of gingerbread men. Make a hole at the top of each ornament so you can thread ribbon or string through. Let dry and hang the ornaments in your Christmas tree. Deposit the cinnamon and applesauce in the Ziploc bag. Seal the bag, removing as much air as possible, and knead the contents until dough forms. Use cookie cutters to cut Christmas shapes or let children create original shapes. With the drinking straw, make a hole at the top of each shape (so you can thread ribbon through when you are done). Let dry for approximately 24 hours (the shapes must be really hard). Thread ribbon through the hole at the top of each shape and hang them in your Christmas tree. The shapes will add a cinnamon scent to your tree for several weeks. (Open models-Gingerbread) Print for each child. 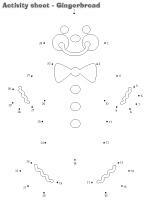 Let children color and decorate their gingerbread man as they wish, but ask them not to decorate the face. Take a picture of each child, cut out his/her face, and have them glue it on their gingerbread man's head. (Open models-Gingerbread) Print and cut out several different sizes of gingerbread. Decorate them with glitter, lace, ribbon, cotton balls, confetti, etc. Glue the shapes back to back on either side of ribbon or string. Hang from the ceiling. (Open puppets-Gingerbread) Print the models on heavy cardboard. Have children cut them out and decorate them. Glue a Popsicle stick behind each model to create puppets. (Open models-Gingerbread) Print. Let children decorate the garland. Cut it out and hang it within the daycare or near your daycare entrance. (Open models-Gingerbread) Print on heavy cardboard and cut out the shapes you wish to use. Keep only the contour of each shape. Glue a piece of cellophane paper on the entire surface. Glue glitter around the cardboard contour. Display your stained glass masterpiece in a window. 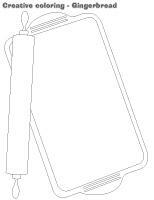 Variation: Trace a shape on a piece of Mac-Tac and cut it out. (Open miniature gingerbread man) Print, cut out, and color. Glue the pieces on an empty toilet paper roll to create a miniature gingerbread man. Hang from the ceiling or in your Christmas tree. (Open models-Gingerbread) Print for each child. Have children tear and crumple tiny pieces of tissue paper. They can glue the crumpled pieces on the shape they prefer. (Open creative coloring-Gingerbread) Print for each child. 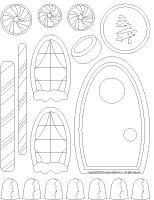 (Open coloring pages theme-Gingerbread) Print for each child.